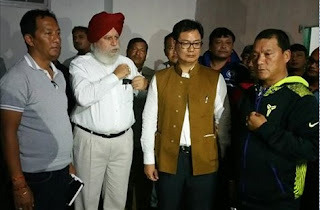 The Minister of State for Home Mr. Kiran Rijju arrived in Darjeeling yesterday night, and along with Darjeeling MP SS Ahluwalia and GTA Chief Bimal Gurung Official visited Mirik to take stock of the situation. A series of landslides triggered by overnight heavy rain has left at least 38 people dead, 23 missing and more than 500 displaced. According to officials in the state disaster management department, 22 deaths occurred in Mirik, where 13 people were also reported missing. The remaining 17 died in Kalimpong, Lava, Sukhia and Gorubathan areas, they said. Twenty persons were reported injured and 15 missing at 8 Mile and 11 Mile areas in Kalimpong, sources said, adding that extensive damage has occurred to NH-10 and NH-55. The MoS arrived in Darjeleing following instructions from PM Modi, and went straight to visit Tingling the worse hit village in the Mirik region. The Minister interacted with the family members of the deceased and promised to speed up relief efforts. Taking a non-confrontational stand with the Bengal government, he stated tated the Central Government will have to work with the state authorities. “Our precedence is to make greatest rescue operation. We have to work with the State Government,” Rijiju said. Meanwhile Bengal CM Mamata Banerjee is expected to arrive in Dajreeling today.